My stack of reading materials is growing exponentially. Friends are handing me favorite books, and I’ve found dozens of interesting Titles on Twitter. Sadly though, I am setting my lovely books to one side so that I can immerse myself in my novel‘s research. You know my novel, right? It’s the one you’ll never read, because I will always be writing it. Anyway, I headed off to the University of New Hampshire (UNH) library and checked out nine books to dig through. The only title I’ll mention here is Black Ice by Lorene Cary. I found it at UNH and it looks inspirational. I’ll let you know all about it in a month. 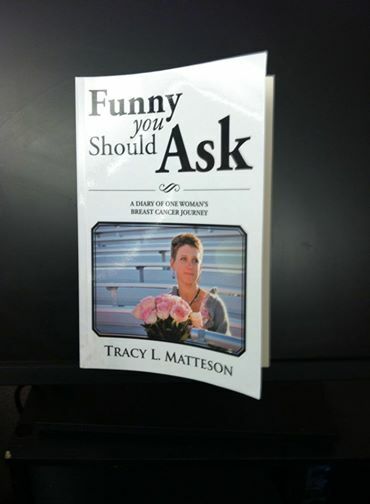 Funny You Should Ask: A Diary of One Woman’s Breast Cancer Journey by Tracy L. Matteson has made my Gold Medal page. To find out more about the book, please read April’s Review. Keep Reading has been updated with brief reviews of two books in progress. I’ve updated the Twitter Authors page with new titles. Please remember, if you read a book from the Twitter Authors Archives, I’d love to hear what you think. Please add your review to Weighing in Here. One last thing: if you find a broken link on my website, please let me know by sending me a comment. I want to make sure that your experience is a pleasant one. This entry was posted in Book Reviews, FYI for Regular Visitors, Health, Reading and Writing, Weekly Brief and tagged Alan Brennert, Book Review, breast cancer, favorite books, Lorene Cary. , Moloka'i, Tracy L. Matteson. Bookmark the permalink. Your plight sounds familiar! My husband is a writer, and the only books he reads are for research. But when he’s running, or doing yard work, or when he travels, he listens to audiobooks, many of which we share through our audio subscriptions. Of course, you may relish the peace and quiet in your car or when taking a walk, but it’s a great way to get in some of that “reading” you’ve been longing to do. I love “reading” this way! I travel a lot for family events, etc. and a book always travels with me. Thanks so much for commenting!